Tray-app is a set of gtk programs that reside in tray and do very useful things :) and don't clutter your desktop. Almost all modern Desktop Environments and windows managers have got tray (notification area). For those that haven't got it, it's possible to use applications like trayer that easily can be found in ports collection. All tray-app programs understand -i option that can invert color of tray icon. By default, the color is white. But for light-colored trays it will be more convenient to switch icon color to black. 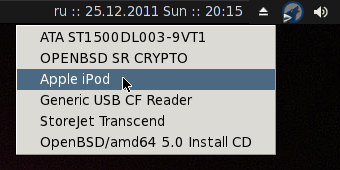 The program is very nice addition to the hotplug-diskmount. It allows you to safely remove any plugged disk. It determines number of partitions it has and tries to unmount all of them. And finally, the program ejects the disk (if supported by the device). As long as unmounting requires root privileges, you should run eject via doas. On successful eject, eject shows notification using desktop notification daemon (e.g. notification-daemon). If it fails to eject, it shows message box with the reason that causes the failure. This program is for laptop users which shows charge level of the battery. This program allows you to change audio volume. tray-app-0.4.tar.gz - (15 march 2016) - support for force unmount is added. tray-app-0.3.1.tar.gz - (17 november 2015) - struct disklabel is changed in OpenBSD source code after 5.8 release. tray-app-0.3.tar.gz - (12 march 2012) - Show "Safe To Remove Hardware" notification after ejecting a device. tray-app-0.2.tar.gz - (28 december 2011) - Correctly place audio mixer window. tray-app-0.1.tar.gz - (25 december 2011) - First release. Copyright © 2006-2016, Alexey Vatchenko. All rights reserved.